I have been researching my family who homesteaded for about eight years near Osage, Saskatchewan. They were there from about 1910 - Dec 1918, had five children including my mother, but left and returned to the US when my grandfather died following a fire--he was attempting to thaw the fuel line on his tractor with a newspaper torch and the fuel exploded. The homestead was at Sec 15, Twp 11, Rge 12, W2, (based on the birth certificates I have available for two of the five children) just three miles south of Osage at Sec 33, Twp 11, Rge 12, W2. This compares with my cousin's recollection of her mother's statement the homestead was three miles from town. In the process of research, in her mother's belongings, my cousin came across the attached picture of the school house at Osage. It is actually a postcard. It does not have a date, but the postage side calls for a one cent stamp. 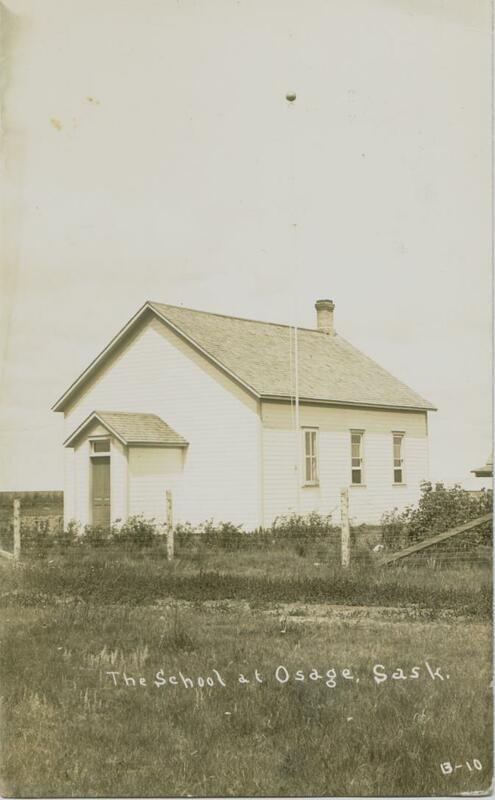 While I did not find this school in the list of "One Room School Houses", it appears from the photo that it probably qualifies. Hope you find this useful. The second attachment is another, similar postcard which was with the first. 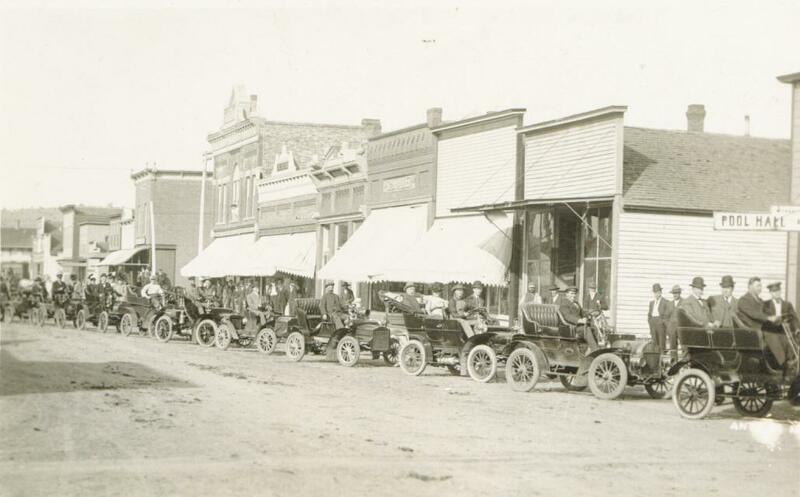 It shows a "parade" of vintage autos on what may be the main street of Osage. That assumption is only because the cards were together in my (deceased) aunt's belongings. Discernable on the actual card, the writing in the brickwork on the storefront in the middle is "18 Geo. HALLER 02". That may help to identify the location. The Sask Gen Web site is great. I have found the information well presented, interesting, and very useful. Appreciate any suggestions on places to look (on-line) for possible reports of the death of my grandfather, Herman Petersen. I'm also looking for anything on his wife Laura Elizabeth (Padgett) or any of the children born in Osage--Henry Herman, Laura Lizzie (Elizabeth Laura), Otto Oswald, Charles Christ, and Elenor Margaret . I was unable to find Herman's name on the homestead site. About Our School 33 Central: Fillmore, Osage, Creelman Schools. It is the intention of this site to make early Saskatchewan school and school district names and locations available to persons with a historical or genealogical interest in this area. There are no service charges or fees for use of this map service, and use of this site constitutes your acceptance of these Conditions of Use. This page is dedicated to the free sharing of this Saskatchewan historical data. Any further use would require permission from Bill Bryanas per copyright laws in Canada and contact the listed Julia; Saskatchewan One Room School Project web master Julia Adamson or Sask Gen Web Webmaster with proof of this consent.